After getting involved in a disturbance with door staff at a bar in Portadown a 20-year-old man became abusive to police who arrived at the scene. Noel Burns, Thomas Street, Portadown, admitted a disorderly behaviour charge when he appeared last Wednesday at Craigavon Magistrates Court. He was fined £200 and ordered to pay a £15 offender’s levy. 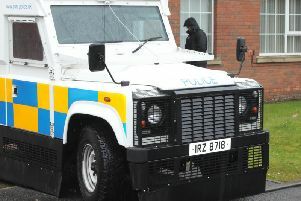 The court heard that CCTV operators notified police of a disturbance outside a bar at West Street in Portadown. They saw the defendant punching out at door staff. He was highly intoxicated and was unsteady on his feet. Burns claimed he had been assaulted by the door staff who said he had been ejected from the bar. The defendant refused to go home and was offered a lift in a police vehicle but again refused. On numerous occasions he told police to ‘f—k off’ and called them ‘peeler scumbags’. Burns then punched a shop screen and when he was caution by police he replied ‘f—k off’. A solicitor for the defendant said this was completely unacceptable behaviour. Burns had a previous caution for disorderly behaviour. District Judge, Mr Peter King, said in terms of disorderly behaviour this was slightly above the base because of the continued verbal abuse towards police officers. He added Burns was fortunate that the bar staff did not want to take the matter any further.